We’d certainly give Rave Review a rave review. Established in 2017 by design duo Livia Schück and Josephine Bergqvist, the company aims to upcycle garments into new products. The official launch took place during Paris Fashion Week in Spring 2018 and the brand subsequently showed at Stockholm Fashion Week. Upcycled couture is a good description for their pieces. Rave Review takes pre-existing textiles and works them into exciting new silhouettes. Sure, lots of other brands are also intent on making sustainable fashion luxurious and cool. However, we think (a) they should all be championed and (b) Rave Review makes something special with its eye-catching, beautiful pieces. Just take a look at the images here. 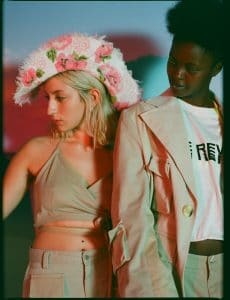 Here’s the bit that requires repeating: the ethos behind Rave Review and some other leading sustainable fashion brands is that the future of fashion requires us to combine the notion of ‘re-making’ with luxury – of really proving to followers (and doubters) that high-end fashion can also be ethical and sustainable. Schück and Bergqvist went to the same design school in Stockholm. They shared the same interest for fashion design made with sustainable materials and the dream that they could change the way that people view fashion, as well as reduce the fashion industry’s disastrous impact on the environment. The starting point of the design process is to find the materials. The pair like to work with materials that people don’t usually associate with fashion, like men’s chinos or home textiles such as tablecloths and towels. Most of their fabrics are sourced in second-hand stores, from antique dealers or bigger clothing sorting companies. Some of the pieces are made purely from recycled fabrics. We’d certainly agree. These pieces are fantastic and the (ethical) passion behind them is exceptional.